What do you do when QuickTest Professional (QTP) doesn’t automatically recognize an object in your application? In my experience, these are the first six things to try/check. It’s pretty basic, but be sure you have the correct add-ins selected. If QTP is only recognizing your objects as standard WinObject this may be a sign that you need to use an add-in. Sometimes QTP’s ‘Display Add-in’ Manager on start-up option, under Tools\Options\General may not be selected. This setting may cause you to start QTP on a machine and mistakenly assume that all of the correct add-ins have been chosen. Double-check by opening your script and selecting File\Settings under Properties ‘Associated add-ins:’ verifying that all the needed add-ins are listed. Also make sure QTP is started before the application under test. QTP will sometimes not recognize a web application if the browser was opened before QTP. Research the issue. If your add-ins are fine, the next step is to search the HP’s Knowledge base. Again, this may seem obvious, but a surprising number of people fail to do this. There’s nothing worse than spending hours on a script only to discover later that there is a patch (for example see patch that resolves some QTP 11 object issues) available or a posted solution that will solve the problem. I’m sometimes hailed as an automation genius by fixing something that an engineer may have been struggling with for days, based on information I found in the KB. Often, even after I tell the engineer how I solved the issue, they still don’t check the KB the next time they have a problem. Do me a favor — don’t be that guy (or gal)! Check the KB. (If nothing is found in the KB, another great resource to check is SQAForums. Look at all the available object’s operations (both the “identification properties” and “native properties” methods). You’ll be surprised what you’ll find lurking around in an object’s properties that may help to automate it. Using .Object try as many operations as possible–even ones that may not seem remotely relevant to the action you want to perform. For example: I was having a problem recognizing text on an application’s custom .NET grid. After spying on the object and trying several different methods that sounded promising, I ended up trying an odd one, called GetViewStyleInfo, and surprisingly it worked! Check out my post Secret on How to Enter Text in a WebElement for another example of using the .Object method. RichEditBoxICW "0","ENTER","No=>","N","Do you want to queue this activity?" '* @Documentation  Used to perform valid actions on RichEdit objects. The application’s developers can help you. Ask your developers to expose a method or add a property that will make automation easier. But before you ask — make sure you’ve exhausted all the above suggestions. Developers can be a tough bunch, and you really don’t want to annoy them with things you could have resolved on your own. I work with some awesome programmers, and as long as I’m able to clearly explain to them what I need and why they never hesitate to help. 6. Make sure there is not a patch that will help. Sometimes there are known issues with object recognition that only a QTP patch will resolve. Also new patches sometime include support for newer version of AUT like .NET or Browsers. These are my top 6 suggestions – what are yours? Hi Mahesh – What actions are you trying to automate in the tree view? I’m not familiar with that control but I was able to download a sample app from Crownwood.net. If I knew what you are trying to do I might be able to help. Did you try using the .Net Windows Forms Spy? I was able to use some of the Native Properties of the treeview control in the sample app. For example i was able to use the objectPath.Object.ExpandAll() method to expand the treeview. I also noticed that the keyboard buttons like Home, End and PgDn along with the arrow keys allow me to navigate to the nodes in the treeview. I am having object identification issues with Silverlight and QTP11 (QTPNET_00120 installed). Could you please share the link to download QTPNET_00113? Its supposed to solve object identification issues with QTP11 and Silverlight. I’ve also found that issues with both memory and window focus can be issues that can crop up. Typically the above you mentioned are the first set of frustrations to deal with but once you have working scripts, secondary problems with objects suddenly not being recognized or worse, being temperamental from one test run to another. If you have an application that requires multiple add-ins, this can be even more so. Sometimes having QTP restart every so often can help as well as of course just adding additional memory (though I’ve found that this is only a stop gap in large test runs). Larger test runs or tests that run continuously will have to do more to manage their memory resources. Buggy scripts with memory leaks can also be a culprit in this light. In particular I know the .NET add-in has issues with the object recognition dying from time to time overall. Ultimately it’s something I hope HP will eventually make more reliable but in the meantime, workarounds are out there for some of those quirky issues. Though admittedly it can be very frustrating, especially with custom applications that are using multiple technologies requiring various add-ins. The trick is to not keep beating your head against the wall in the same spot, try different approaches or else all you end up with is a bloody neck stump and one hell of a headache. Another thing to check is “Record and Run” setting under Automation menu. If you try and identify an object in an application that doesn’t match the rules here, it will show as a standard Windows object. I do have to take exception with your suggestion number 2. In my experience, HP’s Knowledge Base is just about worthless. In the first place, its nearly impossible to find HP’s KB in their nightmare of a web site. Secondly, if you do manage to stumble into it (I swear, they change the location daily) it’s nearly impossible to find any QTP-related information. HP just doesn’t support this product. I called their help desk regarding a concurrent license issue, explained my situation, and the response I received was, and I quote: “Quick Test… is that one of our products?”. This was about a year after the acquisition. Other than that, your suggestions are spot-on. I don’t know how many times I have slaved away to find a solution to an object identification issue, and then remembered to use “Low level recording” from the Automation menu when recording. Its a massive timesaver. Yes its slightly dodgy, but if you just have one object that is an issue to capture, I say use it and move on with your life. Only ever used it with badly implemented add-ins, like Adobe’s PDF add-in or the SAP add-in when someone does something creative. HP was pretty supportive with the SAP issue I had that I got around with low-level, and they issued a hot-fix. In past web projects I haven’t needed it. Thank you so much for your blog. I was having trouble retrieving value from a static WinObject. I tried everything including different options for GetROProperty but all in vain. I then searched your site and tried GetVisibleText property which gave me the answer I was looking for. Thanks once again! i work with qtp 11 and have issues navigating to any url when using it with IE8 (not the case with IE7 ), qtp simply skips the control to the next statement resulting into error. secondly other functions gives “general error” , please help ! I am working on automating an Excel 2007 application using QTP11. The problem is that the menu and items of Excel Ribbon are not recognized.Upon spying, the entire ribbon is recognized as WinObject. It is expected for QuickTest Professional to generate coordinate-based methods and WinObject class objects when recording against Excel or Word, as Microsoft Office products use customized controls. This means that most menus in the Microsoft Office Suite are not standard menus and will not be recorded using standard menu statements. 1. Record maximizing the Excel\Word window. 2. Add the parent menu, the menu item in the menu bar, to the Object Repository. For instructions no how to do this, please refer to Document ID 21858 – How to add an object to the Object Repository. 3. Insert the GetTextLocation method into your script using the name of the menu item you need to select. 4. Finish up by generating code that will verify if the menu item was located correctly, and if it was, then QTP should select it. You can also use the menu’s keyboard shortcuts to select menu items. ‘ ALT + F and A is the shortcut for File -> Save As. You are a true Genius. I wish I had visited this blog earlier. I used the SendKey feature but it is unreliable at times. Is there a way to work on the COMAddIn object to access the Menu and Items? The Excel Object Model Reference is not of much help in this regard. prashanth » Hi Prashant – Thanks! Unfortunately I’m not aware of a way to interact with Excel menus using COM – I don’t think it possible but I’m not 100% sure. I am Currently working in a .Net application. Jack » Hi Jack – it’s hard to tell without seeing the app or code. Is there any way you can post a small code sample. Has any one else seen this behavior? Thanks for responding,That issue is something to do with QTP settings,The same code works fine in different system. I’m faciling the same issue, can you pls guide me on what settings need to be changed? I am facing some issue with qtp11 while recognizing the objects in Java application. Some objects are recognizing as ‘javaobject’. For example there is a JavaTable in the application, But when I spy through QTP11, it is showing as ‘JavaObject’ with some name ‘KTable’. Could you please help me regarding this one. I am using only ‘Java’ as add-ins in qtp11. I’m using QTP 10 to automate a web application on IE 8 browser. I have recorded the scripts and its been working fine for past 3 months. But after the latest web application build update, none of the scripts are working. There are two version of same web application(almost 99% features & UI of both the version are same) where the old recorded scripts works perfectly fine in one version, whereas in other version it doesn’t executes even a single line of the script. When i use Object Spy, It always selects the whole page & displays its properties as “Page” instead of WebElement, WebButton etc. However, in the other version where the scripts execute fine, it recognizes the Web objects correctly as WebElement, WebButton etc. The same issue persists even when i do step generator as it recognizes all the web objects in the web page as just ‘Page’ object. I tried so many solutions like uninstalling QTP & re-installing again, enabling BHOManager add-on in IE and even re-installing IE 8, but still couldn’t find any solution. I would be very much thankful if someone could suggest me some solution. Hi, I am gettting below error when I try to execute the scripts on IE8 with qtp 11. It was working fine with IE6, can you plz help me in troubleshotting the issue. The Selected Object Can not be found in application. Check the application is open to correct page or window and that the object and its parents do not have parameterized values. rahul » What happens when you spy on the object – does QTP recognize it and show the same properties that are in IE6? Can you record the problem action in QTP and compare the OR info that QTP automatically records against your scripts OR and verify the properties used to identify the object are the same. 1. Go to Tools -> Options -> Web tab. 3. In the “Create a new Page test object for” section, select “Every navigation”. 4. Click to close the dialogs. Just came back after christmas vacation. Thanks for the reply. However i tried that already and its not working. Now with the help of a developer i have identified that they have used JSP for that frame which is giving issue. The properties changing dynamically. I came across your blogs just recently and realized what I have been missing till now… Thanks for sharing all these ideas! I need your suggestions for an issue i am facing. While trying to automate an application, I am facing problems in identifying the objects in it. Only the window is recognized (as Window object), but no controls within the window is recognized. Language used: C and Java. Is it possible to automate such applications by using some specific add-in? Vijay » Hi Vijay – thanks for checking out my blog! First QTP will not work with AIX or Solaris. It should work on standard C and Java applications as long as custom controls are not being used. Even when I try to get the ChildObjects for this Window object, I get an object count of 0. Any suggestions? Wondering if you can help me with an existing issue. When using Object Spy in QTP 11, or learning from the Object Repository, those tools view all objects as WinObjects. Obviously I cannot manually add steps by referencing all those winObjects in the repository (which is what I desire to do). However, when recording directly from QTP all the objects are correctly recognized. I’ve installed the QTP patch 00709. I’ve tried every suggestion relating to the Record settings. I’ve loaded every add-on and rebooted. Nothing works. If you have any other suggestions i might try I would be very grateful to here them! Am back with another question. I need to get the QTP results in HTML format. That HTML result window should show the test start time, end time and test name. It should also give the column name, data entered in the Global data table and the status(PASS/FAIL). Which is the shortest and best way to do this? Madan » Hi Madan would using the built in HP Run Results Viewer Export to html work for you? In the results go to File>Export To File>Export Run Results and select Detailed format and click the Export button. The save as button should appear with the ability to Save as type HTML files. In QTP 11 trial version, i’m able to record and play but the recorded format in expert view is as below. As you can see here there is no object name like WinButton , WinEdit…etc. So i want to know what is the problem here? Usually for an object identification process QTP goes accroding to the following hierarchy of properties ..
& then the visual relation identifiers etc. But the best way to deal with problems of the kind mentioned above is making use of regular expressions while describing the object properties. Ex. You have a text box whos property say innertext keeps on changing everytime the application loads . We can make use of “. *” regexp as given below to handle such issues . we can make use of describing inner text as : ab. * so that qtp can identify it . Very useful article indeed. Have hit a small road block hence seeking some tips . I am automating an application who’s UI is basically designed in JAVA with help of JAVA controls. But when I try to spy on the AUT with QTP the object spy highlight chunks of object or I can say group of objects together rather than giving me insights on individual objects. This is my first time on stand alone application testing. I have included the Java – Add-in also QTP records perfectly fine. Any clue as to where am I losing my track in the object identification/capture process. Thanks for the platform you have here. I hope you or anyone participating in your blog can come to my help. I am working on a web application that is giving me a nightmare. There are few sections of the application where I have to open some reports and perform operations on these reports. The reports are basically big document or information pages. Once any of the report pages are opened, QTP takes long time (like 2 to 3 minutes) for any other operation to be performed. Even a simple click of a button would take that long. Because of this problem, my test is taking many hours to run(7 to 8 hours to run). If I find a solution for this problem, the test should take about 3 hours to run. Any idea how to resolve a problem like this one. I am using only the web Add-In and don’t think any other Add-In is needed. udhayakumar » Hi did you resolve this yet? What happens if you try using the ANSI codes to remove the bracket characters from the string? For example chr(91) = [ and chr(93) = ]. Hope this helps — if you found a solution let us know about it. I am automating a webpage developed using FLEX. We are not able to identify individual objects on the browser; the entire page is being identified as a single object (webobject). 2) While building the FLEX we have instructed the developer to include FLEX Automation related libraries. Any pointers on this would be highly appreciated, thanks in adv. one of the application in our project is set up as a single-application system (Windows 7 embedded) where we can see only that application opening on the machine and nothing else. It is like an OS to that machine which will be launched every time we switch on the machine. We cannot install QTP in that system as that is a standalone machine with only that application installed in it.So, to automate it, we have to remotely access that system from the machine having QTP installed in it. Is it possible to automate that application using QTP by remotely accessing it. Add-ins of QTP: Dotnet,Infragistics,WPF (tried with them)..
Kishore » Hi Kishore if I understand your setup correctly I don’t think QTP will be able to recognize anything. Since QTP will not be on the machine that has the app when you use the spy it will recognize everything as a big window/bitmap. You might want to take a look at a trial version of eggplant (http://www.testplant.com/products/eggplant/) and see if that works for this situation. Good luck! First a big thanks for you blog !! We had been using qtp 10 for our .net application and sometimes QTP does not identify grid objects due to the hierarchy change..Like for example…when we started off, it was wpfwindow(“windowname”).swfwindow(“windowname”).swftable(“gridname”)……But is sometimes shows, just swfwindow(“windowname”).swftable(“gridname”)….so QTP does not identify that grid…It is really confusing why this hierarchy changes time and again and any insight or solution on this issue will be really helpful…Thanks again !! I am working on .net application ,qtp is not able to identify combobox,radiobutton instead identifying as swfobject .can u please suggest to solve this problem. If above doesn’t work, HP Support strongly recommends performing a detailed-guided un-installation process. Thank you for valuable suggestion. Has anyone had success in using the Adobe PDF Test Toolkit with QTP? I have tried the very little that I have found but there is not a lot out there in testing of PDF files. As far as I can see/guess, I followed the online instructions and I do get the AcroQTP add-in showing in my Add-in Manager. I follwed your 6 steps and found that AcroQTP was not loaded within the Associated Add-ins in the File->Settings. … I get a Microsoft Visual C++ Runtime Library – Runtime Error! Program C:\Program Files\Adobe\Acrobat 9.0\Acrobat\Acrobat.exe — The application has requested the Runtime too terminate it in an unusual way. Please contact the application support team for more information. I have tried turning off all Add-ins except for AcroQTP but still I can not recognise Acrobat . Any ideas on this? Thx! Lorena » Hi Lorena – I’ve actually have never heard of the Adobe PDF Test Toolkit. If its free I will download and try to figure it out. Anyone else have any real world experience with this? I am having problems recording Microsoft Application Virtualization (App-V Applications) When i record even in low level mode it doesn’t recognize any objects(using QTP 10),does anyone know how this problem can be resolved? I have qtp(11 version) scripts for Siebel(7.8 version) application and IE(6). Now we need to upgarde the scripts tp Siebel(8.1 version). Could you please let me know does QTP version 11 support Sieble 8.1 on IE 6 version.If it does not is there any patch for the same. There are no Siebel patches that I’m aware of. Please let me know if there are any other settings which need to be done for QTP 11 to identify the Siebel 8.1 objects on IE 6 browser. Are there others I should PDF consider? I can use thw AcroQTP methods, but when recording in QTP, my Adobe Acrobat or my Reader are not being recognized when selecting buttons, etc. Supposidly, I should be able too. I have installed QTP 11, Flex 4.5 version and Adobe PDF Test Toolkit for Acrobat 9.2 or Reader 9.2. I have selected 3 addins as given in help file i.e. AcroQTP, Flex 4.5 and Web. Now, Can you help me how should I go ahead with pdf automation ? I want to compare all the contents of PDF with expected data in Excel. For a booth number field 10 when typed values commencing from 10 like 08610,08611 etc are shown though not as a drop down. Only the value selected from the list is accepted by the webpage. the value like 08610 isn’t either recorded or is played back when script is run. Please suggest how to proceed. If I can make the tool click space after the text that will help me proceed further. Please suggest. Vijayaraj » Thanks Vijayaraj – glad it helped! I am not able to record an (.Net 3.5 with winforms) application properly. The addins selected are .Net, ActiveX, WPF and VB. QTP version used is 10.0. All the objects are identified as WinObjects when i do an object spy. Please suggest a solution. I have heard of NetAdvantage but completely unaware of how to install and use it. Will it solve my problem? Or I am using the wrong set/combination of the addins. Tip 6.3 – Always start QTP First, After open Application(Web Or Windows based), then only QTP identify respective objects, I have seen people not identifying any Objects because they first have already opened applications in their browsers and after they start the QTP, and QTP wont identify any of objects. I need help regarding my question yeterday, for QTP not being able to reckognize list in a windows application. please respond I would really appreciate your hel[. Apologies for the messup on my previous email. I think developed in C which we cannot get access to. rest no matter what row or part of box I click I see the same. I want to collect and compare with data from UI data. Need you expert advice to resolve this issue. It does recognize many objects, it recognises whole the list box as one (The properties of the list box are as mentioned in my email above).Also it does not recognize any buttons at all , we have to use the hot keys for that , we are using discriptive programming to automate the application. I tried using virtual objects it did not work either. What are these numbers on the recording after the click, I do not understand it. This is my first time working on windows based client thick application. Any suggestion if any Addin is needed, or any other suggestion you might have. I really thanks for all you support. Even after installing patches 90 and 92 for supporting firefox (using firefox 10), QTP is not recognizing the firefox objects. It is showing as window object. Prasad » Not sure – the patches work for me. Does this happen on all web pages? If you spy on something simple like the Google search textbox does it recognize it? If you have this behavior on against all web pages it sounds like you have a corrupt You might have to do a clean uninstall and reinstall. I thank you.Many of my problems are solved going through your website. How to perform click operation on OracleRadiGroup as qtp perfoms Select not the click operation. Any help would be highly appreciated. sunil » Hi Sunil – I’m looking at the QTP documentation for the OracleRadioGroup object and I do see that Click is a valid Method for it. Not sure why it’s not working for you. When you manually click on it what is it suppose to do? Sorry for delay in replying to your mail. There is an oracle radio group button with “yes” and “no” option. When i click manually the radiogroup on “Yes” option it invokes new window. But if iam trying to select oracle radio group through qtp it does not invoke another window. When i Checked with developer he said when click method is performed on the oracleRadioGroup then it invokes the window not by selecting the “Yes” option. I have used Mercury.DeviceReplay by capturing the co ordinates of OracleRadioGroup at run time but it is not consistent. sometimes it works and sometimes it does not work. Could you please help me out? Iam using Descriptive Programming. QTP is unable to identify while executing ,as some times coming Browser , some times coming as Siebelapplication,can u plz help me on this? Browser|Siebel application. When QTP runs it will work against either Browser or Siebel application. Make sense? Hi joe, i was happy seeing your blog having solutions for many of our problems. And i do need a help.i want to run a desktop application which is based on flex. I have added flex add inn but still it is not able to recognize at Add-inn manager. And when i record the desktop application, it is getting recorded like this what is that number after click? if you are not able solve can u please suggest automation tool for desktop application for flex? Thanan » Are you sure you are loading all the correct add-ins? Do you know what technology is used in your application? I know that for my application the login page uses standard web controls but the rest uses .NET and ActiveX controls. So if I only load the Web add-in QTP will recognize the login page but not the other screens. I am using QTP 11 and trying to automate our web application(uses GWT 2.4) in Firefox. Some of the web elements are not identified. Using object spy i found the properties of those objects and i passed those properties and some of objects are identified using “Index” property. This “index” property value changes in different run of the application. So can u pls suggest any alternative ideas to identify these objects. Note: I also used GetROproperty which will work sometimes. code is below, pls check. Pls correct me if i am wrong. Pls suggest ur idea to identify these objects. Nijas » Hi Nijas have you tried using the new QTP11 feature “Visual Relation Identifier”? Great Thanks for your valuable inputs! I am automating a web based application using QTP 10.0. Here, the objects of the child window is not getting recognised.. it says “Object does not exist…..” .. i did object spy, added the object again… still its throwing the out the same error! 1. Wrong properties to identify the object for example: An html id is used which has been changed. 2. There are multiple objects with same definition. for example: When identifying an object without specifying any ordinal identifiers (index/location/creationtime) and the specified description results in multiple object matches then exist would return false. 3. The specific test object Add-in is not loaded. Test objects can be accessed even when the Add-in has not been loaded but the functionality for such test object doesn’t work without the add-in. wt might me da reason? I AM USING QTP 11.. I INSTALLED AIR AND FLEX UPDATE FROM ADOBE…. QTP IS STILL UNABLE TO RECOGNIZE THE COMPONENTS AND SAY MICROMEDIA FLASH OBJECT… PLEASE TELL ME WHAT TO DO !! kartik » Sorry Kartik I’ve never used the ADOBE add-in for QTP. Does anyone else have any advice for Kartik? could you please help in understanding the difference between virtual objects and user defined objects. I kinda know the definations but just getting confused as to where and when should we use which of these. Since both of these are used in situations where QTP is unable to identify the objects, how do we find out if we need to create virtual object or just map it to standard windows class test object as a user defined object. Hi am using qtp10.object spy was not working properly. can u help me on this..
Charan » Hi Charan – can you please provide more info. What is happening? Are you getting error messages? What technology are you testing? What OS? Nice article. I need your advice on Powerbuilder Addin issue. Siva » Hi Siva – not sure what the issue is — I have not tested any Powerbuilder apps. Are custom controls being used in the application? Does the QTP spy correctly identify any of the fields? Why is it mandatory or advisable to launch qtp first and then AUT ? why do you think application objects are not identified if AUT is launched and then after some time QTP is launched. Sat » QTP needs to be able to hook into the application. If the app is already launched this sometimes causes recognition issues. I am not able to open QTP Test Script in Quality Center 9, I am able to save the script in QC but when I am trying to open it in Test Script Tab of QC a Message box displying Can’t Load the Test “path of the test”. Yes it happen for all test(vb script file), I guess it is because of MS-Office I have installed office 2003 in window 7. While recording using QTP 11.0 enabling Addin i.e ActiveX and Web, I am unable to record script against my web application which is developed in php. In recording mode after certain steps, my application is not navigating to next page, error message is popped. This only happens when i record. Am using ie8 browser in windows 7.
swapna » What does the error msg say? divya raj » Do you have patch QTP_00644 installed? This patch enables you to install and use QuickTest 10.00 on Windows 7 and Windows Server 2008 R2 operating systems. Also is this a 64 bit application? Using QuickTest Professional version 10.0 and below to test 64-bit applications is not supported. QuickTest Professional supports testing on applications based on Win32 API and MFC. QuickTest Professional version 11.0 supports test particular techonologies on 64-bit applications after installing patch QTP_00699. I am new to QTP. I have installed QTP 11 and am running the scrpts that are already recorded using QTP 9.5. QTp is not recogniszing the pop- up click buttons, links …. I tried to do an object spy on the window links and it recognizes everything as a WInobject :Internet Explorer _ Server . I’m using QTP v10.0 with Windows 7 and IE 64 bit – I read one of the replies and it said this was not supported? Should I upgrade to QTP v11.0? I’m having issues with all of my steps being scripted – I can’t get the script to acknowledge radio buttons which is in Java Code and I have the Java Add-in? I have coworkers using QTP V10.0 with XP and they have no issues. We have the same add-ins so I’m not sure why mine isn’t working unless there is a issue with W7 (IE 64 bit) vs XP. Any suggestions? Renee Dye » Do you have patch QTP_00644 installed? This patch enables you to install and use QuickTest 10.00 on Windows 7 and Windows Server 2008 R2 operating systems. Also is this a 64 bit application? Using QuickTest Professional version 10.0 and below to test 64-bit applications is not supported. QuickTest Professional supports testing on applications based on Win32 API and MFC. QuickTest Professional version 11.0 supports test particular techonologies on 64-bit applications after installing patch QTP_00699. I’m trying to use QTP to identify objects on a UI built on QT. Is there any QTP Add-In available for that sort of UI? Eduardo » Hi Eduardo – HP does not have a QT add-in that I kow of. I also did a search on HP KB and QT’s site and could not find any 3rd party add-ins for it. Joe Colantonio » FYI – just heard a “rumor” that the next version of QTP(UFT) will have a Qt add-in option. Thanks a lot and congrats for the blog! Joe, any heads up on QTP 12 release time? 11 has been out for almost two years now. Thank you. Ben » Hi Ben I think they are really close. I’ve been evaluating the beta for a few week now. My guess would be that it will be released in 1 to 2 months but I have not heard any official dates. I am facing problem regarding testing FlexCustomComponents with QTP.. But my FlexApplication also has complex customcomponents …. for example …. Can you pls help me with this issue …. ? any help would be appreciable ..
hema » Hi hema – Sorry – I wish I could help but I have zero experience with the Flex. Anyone else have any ideas? I have some scripts created in QTP 10 for a Java App under Win XP. Now we changed to Win 7 64bit (also the AUT is changed to 64bit), after installing QTP 11 with all Patches and addins I tried to run my scripts. It works fine, all objects are recognized and methods are working properly, however, at some aktivities the AUT must be reloaded and from that point on QTP does not reconizes any object (as like the addin is not installed) and also if I stop the run QTP is not able to capture any object but if I reboot the AUT everthing works fine again! any idea? I would appriciate. sasan »For some reason sounds like QTP is losing its hook into your application on the reload. I’m not sure why this is happening and I can’t repro. Has anyone else seen this behavior and have suggestions? Thats ok.. apart from this .. i have another question.. I have installed a plugin for qtp .. that plugin has got added to add in start up window of QTP too… but i have searched my entire PC for the plugin installed folder… am unable to find it… where does this plugin installed folder can be found exactly … do u have any idea? we are stuck in a very urgent issue, pls provide the solution. amit » Do you have patch qtpnet_00120 installed? This patch not only contains silverlight enahcments but also contains all the fixes made for the WPF Add-in since QuickTest Professional 11.00 was released. So if you have missed some of the previous WPF patches— no worries– this accumulative patch will install all of them for you. amit » If this is a 64-bit WPF application that you are testing? If so hen it would be qtpnet_00127. If not it would be qtpnet_00120. amit » Hi – those are the only 2 requirements that I know of. What order did you install the patches in? If you un-install all the patches and start again do you get the same error? I also assume that you ran all the patches as administrator. I just re-installed the patch QTPNET_00127 and it is installed successfully, but the problem of ‘Objects not identified in the wpfgrid’ is not solved. If you download this same sample do you get the same error that you are seeing against your application? Refrence for picklist is not shown in the code. the code should be WpfWindow(“Cascade DataGridComboBoxColumn”).WpfTable(“dataGrid”).wpfPicklist() ??. Please suggest how you are working on the picklist inside the wpftable. in our application, there are Checkboxes and Pickers inside the wpftable. but we are not able to check/uncheck the checboxes in the wpftable. In the sample application, shared by you, i record the steps of selecting values in the picklist but no code is generated in qtp, code is generated only on the actions performed at the application level for e.g. I am working on GWT application and have loaded GWT sub addin in my QTP 11.None of the object is recongnised as GWT objects and still they are learned as webelements.What could be possible reasons.? Shubham Jain » Hi Shubham – are you using customized GWT controls? When you spy on the objects do you see a gwt-id property? No I am not using customized GWT controls.I have simply added GWT sub addin.I dont see any gwt-id property also.I checked in some other application ,QTP do identify some of GWT objects as GWT tree etc which means add in is not a problem.Seeking your expert advice.Thanks in advance! I have an issue when I run tests via QC, it does not recognize a .net toolstrip, but rather it sees it as a winobject. What I’m trying to do is press “Save” in the toolstrip. If it’s identified as a winobject, is there a “work around” for that? Greg » HI Greg – Does this behavior only occur when running from QC? If you just run the test on the machine with QTP do you get the same behavior? Does this occur on only one machine or many? What version of .NET is installed on the machine? 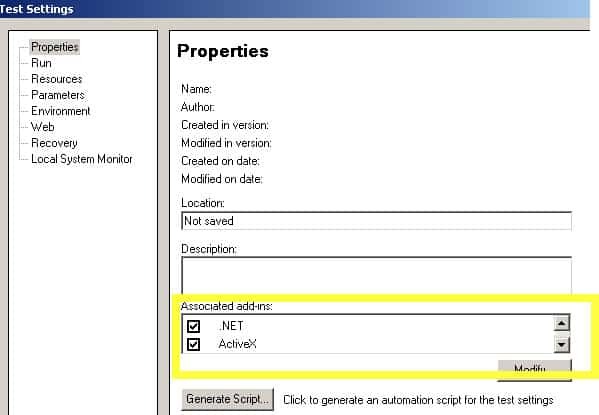 If you open the QTP script that was started by QC and go to QTP’s File>Setting>Properties do you see the .Net add-in checked? It only happens running through QC, I think it’s a memory thing, as the application is a hog. They are developing a web version of the application next year, I can’t wait! Below code is only selecting (highliting) the specified cell. Can you please help us to recognize GWT objects using QTP. I have tried it with GWT addin but still I am not able to recognize the same. My application is using GUI which is made with the help of EXT GWT. We have a requirement to automate test cases for a c++ application using QTP 11. Is there any addin available to enable the QTP to identify the objects.HP support guys are telling to use QTP Test Extensibility API (TEA). What is this TEA and how to use it.. I am facing problem in execution of QTP scripts designed by colleague. The problem is with object repository. The ‘name’ and ‘title’ property for same browser are shown different in my and his system. I tried this with object spy on his and my machine. So scripts are working fine on his system where as not on mine. I reinstalled QTP 10 and restarted my system. But nothing is moving ahead. Could you please suggest something? Erfan » Are you using an object repository? If so in the OR you could add a regular expression in the name and title property value to handle both situations. Yes I am using object repository, but regular expression is not helping. Because ‘title’ property is totally different at both systems. I started execution using only ‘name’ property, as this solution is working. For the same I need to update entire object repository. But I am still wondering how it is showing ’title’ property totally different at both systems. Could you please tell how it is happening? Erfan » I’m surprised a reg expression doesn’t work since I know you can use an OR expression to handle two or more completely different values. Not sure why this is happening what kind of app is it. What OS is on both machines? Does any one else have any ideas why this behavior is occurring? Joe>> It is web application and windows 7 is OS for both machines. I am trying to export report to PDF from test results. The screen shots which i am able see in test results are not being exported to the PDF file, i can just see the steps if it is passed or failed in the exported file but not the screen shots of the steps. I have couple of other projects in QC for my credentials in which i am able to export the reports with out missing the screen shots. Its only happening to a particular project for some reason. Could you please suggest me what would i need to do to export the comlpete report!! i am using windows 7 operating system and i also tryed with different fire fox (8 to 13) versions. but it didn’t recognized. pls replay me as soon as possible. Yugandhar » Hi – QTP10 only supports Firefox 3.5 and 3.6QTP 10 also needs patch QTP_00644 for windows 7. We have recently upgraded our HP QC 10.0 to HP ALM 11. We had saved our automated scripts created with QTP 10.0 in HP QC 10.0 earlier. 2. Any specific add-ins required. Thirupathi » Are you getting an error message? Have you updated the Quality Center and QTP add-ins from the ALM add-in’s page? I installed that one also but its not working. still now object spy didn’t identifying mozilla 3 browser. What can i do? pls help me. Yugandhar » Check out ASI’s post on How to get QTP to work with Firefox. It’s been a big help for others that have tricky QTP firefox issues. We are using QTP to automate on SABRE terminal emulator (using this for fetching airlines customer. Data is fetched from the TPF OS). QTP objects is not recognizing the results of the line commands within the SABRE window. We are using the QTP TE plugin. Is there anyway to overcome this in QTP ? Are there any other add ins ? or any screen scraping tools ? Nidhi » Hi Nidhl actually I’m not sure how to configure QTP to work with SABRE. Have you seen this info in the HP KB? 1. Start the emulator and connect to the server. Verify that you have set a short name for the emulator session that you have open. Please refer to your terminal emulator’s documentation for instructions on how to do this. 2. Go to Tools -> Options. 3. Select the Terminal Emulator tab. 4. Click ( for QTP 9.5 and later). The Terminal Emulator Configuration Wizard will appear. 6. Select the “Configure a new user-defined setting” radio button. 7. Enter in the name of your emulator. 10. On the “Configure HLLAPI Properties”, select the “Emulator supports HLLAPI” radio button only if the communication protocol used to connect Terminal Emulator to server application is either TN3270 or TN5250. Note: If using any other communication protocol, skip to step 16 for extra steps or alternatives. 11. Either enter in the path or browse to the HLLAPI DLL. The DLL normally resides in the terminal emulator installation folder and is generally named ehllapi32.dll, whllapi32.dll, or ehllapi.dll. Note: the HLLAPI file name may differ. Mentioned filenames are based examples of HLLAPI files of “supported” terminal emulator versions. To know which file represents the HLLAPI required to use, check with Terminal Emulator vendor. 12. Enter the HLLAPI procedure name. 13. Select the HLLAPI format. It is recommended you select “Auto-detect.” If, in the next screen, QuickTest Professional is unable to capture the text in your emulator, click and change your selection to either “Classic” or “Extended. Note: Use “Text-only” if QuickTest Professional encounters recording and replay problems. 15. If QuickTest Professional is able to successfully identify the terminal emulator screen, you will see a screen capture in the HLLAPI Configuration Test Screen. 1. Verify your emulator is connected to the host and the short name is set. 2. Check that your HLLAPI property settings are correct (dll path, procedure, format). 3. Change the HLLAPI format to “Text-only”. 4. Select “Emulator does not support HLLAPI” if all the above tips have failed. For configuration instructions using this option, please refer to Document ID KM181366 – Why is there no option to configure the emulator as VT100. 18. You can save the settings that you have configured to a separate file so that other users can copy the terminal emulator configuration settings. How should the user configure an unsupported HLLAPI emulator to work with QuickTest Professional? Important Note: Non HLLAPI emulators rely on text recognition for replay. Text recognition is not supported by QuickTest Professional. For more information on text recognition, refer to Document ID KM195520 – QTP’s Text Recognition functionality is not working as expected. Scripts created against non HLLAPI emulators may not execute as expected or consistently. For information on VT100 support, please refer to Document ID KM177324 – Does the Terminal Emulator add-in support VT100. The above article includes instructions on how to configure the add-in for use with a “non-HLLAPI” emulator. Just replace the name “VT100” with your desired name. For instructions on configuring the add-in for use with an unsupported HLLAPI emulator, please refer to the Terminal Emulator add-in User’s Guide (\help\TE_Guide.pdf). I am using QTP 11 licensed; I am facing the same issue as Vishnu. As you can see here there is no object name like WinButton , WinEdit…etc and only click and move is displayed. Please help me to solve this issue. I wanted to know if its possible for QTP Script to identofy all the existing and currently running objects. the objects are not stored in the Object repository all these objects will be run time. Nikhil Warke » You could use a combination of the ChildObject Method and the GetROProperty method to retrieving the runtime property of an object. The QTP help actually (look for ChuildObjects Method) has some examples on how to use the ChildObject to find all objects on a web page. 1.QTP is recognizing web objects as win objects sometimes . 2.QTP is not recognizing check box and drop menu of web application. I followed all the basic steps like opening the web application after launching the QTP n all. Please help us out it will save lot of time of many of the QTP users …. hi joe.. does QTP 9.5 version is compatible with Windows7/IE8 combination? I am using QTP10.0 for web application automation. Using Descriptive programming, we are identifying Browser with name property like Browser(“name:=Google”). The scripts works fine at my end but at Client side it failed. The browser name property is blank at his end, object spy displays rest all properties except name & openurl. Wht is the solution for this? We are using Windows XP, QTP10.0 & IE7 configuration on both the machines. shrutika » What happens if you use Browser(“CreationTime:=0”) or Browser(“index:=0”)instead of Browser(“name:=Google”)? Yes, QTP identifies the browser with CreationTime/ Index property but not with ‘name’ property. However,I already have 500 plus scripts where browser is identified using name property. Can u please let me know, if I am missing any settings in client’s machine, so that ‘name’ property will be displayed for browser? I have just seen your blog ,and it’s really helpful . I am using QTP 9.5 with TE add-in , and hllapi configuration also done successfully . I could not able to add the objects into object repository but when i spy it is showing the object properties. It is identifying objects “ Window().Dialog() .Webedit() “ when we do object spy , but while adding Objects into Objects Repository it is adding till “Window()” only . I have also observed ,Main window class , that is session ID is changing every time when we open mainframe screen. sunil » Hi sunil – what kinds of unexpected objects? I know in the main application I test we sometimes get certain messageboxes depending on the application settings. For this I have a ifDialogExist function that knows how to hanlde if a dialog does appear. You can also use the .Exist method to check for an object and if it exist write some logic to handle it. I have a doubt in QTP where it is unable to record flash based web applications..Can you please guide me..
Am using QTp version 10 and while recording the web page its not recognizing the labels. Please advice what to do.. I am using QTP 10.0 in windows 7 operating system.here QTP will not recognizing the web objects.Can you give me any solution for that.. I am using Xceed Grid in my application. Although I have created a function by which I am able to work on Xceed Grid but this is not a good practice. Still I am not able to work completly on Xceed Grid. Is there any patch availabel for Xceed Grid Add-in for QTP. Gaurav Gupta » HI – I am not aware of an add-in for the Xceed Grid. Maybe the QTP extensibility can help automate this control. Can you tell me in detail about frameworks in qtp. I have installed qtp11 on windows 8 OS.i’m not able to see the scripts when i record and run the application.And also qtp is not recognizing webobjects. praveena » Hi Pravenna – unless i missed something -as of now – QTP 11 does not support Windows 8. So that would explain why its not working for you. If HP releases a patch or a newer version of QTP that supports Windows 8 I’ll let you know. Your articles are awesome for qtp enggs.. I have one doubt. Our developers made ajax tooltip which built up using Iframe for each element in web page. while spying those object, object spy could not show page and its hierarchy instead it shows only browser object. Can u help me to resolve it? Britto » Hey Britto – does changing the following QTP option help? Joe, you are a genius! You’ve no idea how many times you’ve helped me to debbug my scripts. Why you set the variables to -1 in the function Function getTextXY(strTextToFindXYFor)? Line 63 of point 4. I am setting the variables to -1 because I do not need to specifiy them to identify the text in this example. I have a Query, do you know if QTP 11 is working with RealPlayer application UI. I tried to record, but the menu bar is not recognized. neither in VLC application. I need to simulate RTSP traffic, also recommendation for RTSP library can be good solution if some one have experience with that. Ronen » Hi Ronen – Have you tried getting around the menu options using the .type method or sendkeys to send the menu shortcut keys? So I tried…. search for product = qtp….no results. Search for product = quick test….no results. Search for quick test professional..no results. They don’t even know what their own products are called? 10 minutes of trying just to find the damn product is enough wasted time for me. please guide me, what to do. I am a newcomer in using QTP. Although I have a good idea of manual processes I need to get expertise in the QTP field. Please give some good advice and some guideline too.. I am working on QTP 9.2.i am not not able recognize the frames in my application using IE 9 Browser(using Spy and Even i record i don’t get properties) but it’s working fine using IE 6/7 .Can you please suggest me regarding this issue. But i have recently developed scripts for our SharePoint application on IE9 on windows 7 using the QTP 9.2 which are doing fine.But when i tried my old Application scripts to get it work on IE 9 , Windows 7 the above Issue i mentioned has raised.Here my Question is that how it did well for SharePoint application using QTP 9.2 . Can you please tell me is there any diffenence between the SharePoint and WebBridge. But some times without reason object stops being recognized. There will be huge list of objects…adding them each time freshly is not possible. Please let me know why this happens and whats the solution to this issue. NestWeb » Hi- what version of QTP are you using. When you re-add the object in the OR are the same exact properties being added every time? I really impressed with this site as I got most of my issues cleared., thanks Joe for your support and quick responses!! One more big issue I am facing is that QTP does not recognize fields name in my application . The ObjectProperty ‘swfname’ will be blank. When contacted with Development, the answer is that fields name are rendered in the application and those are not exposed. So our framework is designed like that. My question is that is there any solution using any method that solves my problem? Application= window based ERP .Net app. App Controls=DevExpress ( I know QTP wont support it). QTP version used it 11.
when i re add it its not all different . some property remains the same. Hi Joe…how do i send screenshot of old and new object to you ? can you pls pass me your mail ID ? It’s very helpful blog, I learned a lot. I have a quick question. I am using QTP 11 to automate web-based application. On a page, there are multiple check boxes on one column-1, and I may have to put check mark based on other objects’ requirement in another column-2. If the column-2’s text is ‘Y’ then I have to put a check mark and column-2’s text is ‘N’ then I don’t have to. How can I tie these two objects in one or how can I find common properties between two objects so that i can use that property to put a check mark. Object spy can’t find common property that I can use them. And if two objects are related then why there is no similar characteristics or property, is it hidden?. I Thank you! Rosh » Hi Rosh have you tried using QTP’s Visual Relation Identifier Feature? No I have not tried that one. I will try it and let you know it it works. Sorry for the late response!! I am using QTP 11 to automate Siebel 8.1.1.3. QTP is not recording any actions I do on Customize view of Quotes screen. I click on Customize button on Line Items applet of Quotes screen. QTP records script here. Then as I clicked on Customize button, application navigates to Customize view where I need select items and then click on Done button. These actions are not being recorded at all. 1. Verify the “Siebel 8 eBusiness 8 and later” option is selected. Go to Test -> Record and Run Settings. Verify the “Siebel 8 eBuisness 8 and later” option is selected in the Siebel Version combobox. In the Temporary Internet Files section, click . Click . Windows Explorer will open displaying the “Downloaded Program Files” folder. Click to remove the file. Note: If needed, reinstall the Siebel Test Automation. Thank you for the detailed response Joe. Issue still persists. 1). I am using QTP 11.0 and is recording the actions on all the screens of my siebel 8.1.1 application EXCEPT Cutomize view. So, only the problem is on the Customize view, qtp is not at all recording ant actions done no this view. 1). Siebel eBusiness 7.7 and later 2). Siebel eBusiness 7.0/7.5. So, I have selected the 1st option. I have been using QTP 11 to test my swt based java application, which has many right click operations.Upon every right click, context menu occurs.After done with recording the operation,when i playback it is not doing the right click operation properly. The problem is , for example, there is a SWT Java Table .When i do a right click on one of the cells in that while recording, it is not doing the right click on the same position wen i play back. And it is important for me to use only Default mode of recording. Could you help to solve my problem. how to create my own add is? Vel » Are you trying to create a QTP addin QTP using the extensibility option? how to create my own add in’s in QTP? I’m using QTP 11.0 and web browser Firefox 3.5. While spying, it seems to detect only the whole window and it shows the class as WinObject only.When i tried with the child objects (Editbox,Link,checkBox,Button) also ,the problem is the same. And i tried with different versions of the firefox(Firefox 2.0,3.0,3.6,4.0).But the problem is the same. It shows the nativeclass and objectclass as MozillaWindowClass. sageev » Do you have any of the firefox patches installed? I am trying to automate the entering of data in to two web edit boxes which would then activate a hidden label/link which I want to automate the click of. The edit boxes are used to create a url for the hidden label/link. The problem is that the edit box has to be engaged for it to search a .js file for data to create the link. I have tried using the Set method but that does not seem to engage the edit box so the link does not become visible/active. Not sure how to either simulate typing of text in the box or adding a Return so that the page will notice the text. I am using the datagrid to input values for the edit boxes. Thanks for any help you can provide. Hi Joe, We have a couple issues we can’t seem to find answers for here at work. We created a project execution report in Dashboard/Analysis View and it works fine when the test was run manually, but if we used Sprinter, it wouldn’t give the run steps or the screen shot attachments. The second issue is, when we send the report to someone else, they cannot open the attachment links in the report. This is on HP ALM QC 11. I know there is a ton of patches for both QC and Sprinter. Do you know if any address these problems? Thanks for your help! David Riedesel » What patch level is your ALM at? I don’t use the sprinter so I personally do not know which patch if any will resolve your issues. Does anyone else have any insight into this issue? Joe, We have HP ALM QC 11 with patch 12, and Sprinter 11.5 patch 18. Thanks for your help. Gettextlocation method not working on same system for two different users, I mean when I logged in with ‘A’ user Method is returning ‘True’, but when I logged with ‘B’ user method is returning ‘False’. I am using it for a Window Object in a .net application. 2.Click on the Theme link to bring up the Theme Settings dialog. QTP 11 works in windows 7 ? I am trying to automate a desktop application.The issue is with capturing the data in a table which is displayed in the app.QTP records it as WInObject and with Lowlevel recording,it is written to DataTable with various co-ordinate details.I am unable to get details like number of rows,columns,etc. The number of rows are fixed to 100 per page.But i need to read how many rows are filled with data and get this information. Could you please suggest how could i proceed with this scripting. I had about 900 test cases automated on my app which was on PEGA 6.2. However when my app got updated for pega 6.3 i face serious issues in object identification. Initially objects are identified. However when i click on an application link which populates a table contacting employe data, The entire application is identified as only one page object . I can not go in to more detail like WebEdit, WebButton etc. ” & this is not the correct page name which gets captured when the objects are SPYing correctly. I am using QTP 11 Vs IE 7 , 8 & 9. Please help me out since we are really stuck on this case. Appreciate any input from you. Wicki » Hi Kanchana – not sure why this is – I’ve never worked with PEGA before. Can you reproduce on another machine? Have you been able to rule out QTP – make sure that QTP did not get corrupted. Anyone else have issue with QTP and PEGA upgrade issue? Any input for this, We are really stuck on this issue where my entire test bed is not working. Wiki » Anyone else have any suggestions on the PEGA issue? I think the clickin on the relievent link loads an AJAX based partial page load on the right side panel of the main page . When this happens qtp fails to identity the actual page &its objects. Instead it identify it as a virtual page with a title no where relevent to the page “composite_#####” . Its almost as if qtp is blocked due to an intermideate AJAX related page load. Sudha » What version of are you using? Do you have the QTP windows 7 & IE8 patch 00037 installed? its QTP 10 on windows 7. I have not installed IE8 patch 00037. Can you pls sent me the patch if possible?? does the QTP 11 on windows 7 support reading and writing text to putty? t3hanks a lot,,your blog have helped me a lot to solve my problem and again thanks a lot. I have an image of win object. Application is coded by vb6. When I spy object, I can not find it. I add all objects of form and use “Locate in Repository” and “Highlight in Application”, but I only get parent object – a vbframe. Could you please help me to identify this image object? In my web app, there are two WebLists. For thses two web lists except x,y,abs_x,abs_y, html tag and name remain all are same properties for both. htmal tag and name are changing every time(1week to 10days once). So for thsese unique properties i have given regular expression. The remain unique properties are x n y co-ordinates which we can’t use for diff resolution systems. i added “index” for these both weblists in ObjectREpository as index:=0 and index:=1… even tho its not working while running. In script i put almost all main property names and values like “html id, html tag, Class Nmae, class, name, index. Even tho its not working in descriptive as there are no unique properties in script for thses both Weblists. Desperately ill be waiting for your reply.. Sorry Mohan for my late reply – I somehow missed this. Did you resolve your issue? I have tried most of your recommendations in the past and present. One other approach I use is Virtual Objects via Descriptive Programming. Sometimes I cannot interact with an object, yet I can interact with Virtual Objects. This does not occur often – however it has worked for me well in the past and it is part of my approach. Thanks Roy – great suggestion! I’ve been meaning to write another post on using Virtual Objects. Although they are not the first choice to resolve issue they do come in handy for certain situations. The script tries to load the appliaction under test but it fails. Double click on the exe of AUT. login screen is displayed. enter user name and password in the login window and application should load but instaed of loading the application system hangs. but when QTP is already opened application is not loaded (either manually or by QTP). i am working on java based desktop application. I have 2 text boxes on the login page one for user name and other one is for the password. i have added both the objects into object repository. when I set some vale in username field its doing good but when i set the value in password field its again setting the same in user id field. I have tried the below options but still doing the same. 1. Adding more properties to the password object. 2. Adding index and location to the password object. 4. Tried highlighting the object. when i highlight the object the correct password object gets highlighted but when i set some value it sets the value in Userid field. Please suggest what else can i try. Hi Ankur – have you tried using the .type method rather than the set? “type” simulates the keyboard input and I have tested application that do not like the set method. I am able to recognize al the objects on teh frame (after dev team compiles the application with given files list) on a flex based application. But not the menu item. What could be wrong. Earlier i did used the same and was able to identify the class ‘flexListLabel’ and ‘FlexMenu’. from second method: when application is launched via service automatically, QTP is not identifing the objects in the window. I am trying to automate the Delphi application, i did a recording and it is successful. When i am trying to run the recorded script getting message “Unspecified error”. please help me. This is the first project i am trying for automation. Hi Joe, Hope you can help. I tyring to do some record and play and eventually make some tests that will always identify the right objects. Seems as though when I am done it can’t identify the items anymore when running again. This leads me to believe that the code is generating these fields new every time. i know there are frames, multiples and all sorts of things going on. I have looked at any property. Tried making ones etc to no avail. Still has problems. Any suggestions? Thanks. Here is a code snippet. Seems to always fall apart starting with the mapped frames etc. and the $dynamic. When you spy on it is there another property that can be used to id the frame? Also is there a pattern with the dynamic name is at least the first half of the name unique and does not change if so you could use descriptive program to get around it. I am trying to record a windows based application which is created using WPF and .Net technology. The problem is that i am not able to record the scenarios, QTP is unable to identify the objects.What should i do? Plz help me out. this is happening on only some of the controls in the application. Could you pls suggest the solution for this issue. I encounter an issue while highlighting the OR for Save dialog in MS2010 excel. Getting the object as WinObject NetUIHWND and i want to child objects under it.can u please help. I not sure I understand – when I open QTP and Spy on the Excel 2010 Save dialog I do see all the objects on it. What are you trying to do? Sometimes all objects of my DotNet application become SwfObjects through QTP11. Please help me what needs to be done to recognize the objects with their correct types. By the way if you have some machines (VM or real does not make difference) for only QTP test execution and you trigger the test execution from the QC. You’ve to be sure that a user is logged in on the QTP machine and the QTP machine’s screen is ON. If the machine is locked or a screensaver appeared on the machine, objects won’t be identified. To make sure that i am using Remote Desktop Connection Manager v2.2 (for my 6 Virtual QTP test execution hosts) that forces the QTP machines not to lock and make their screens are always on. I am currently dealing with VC++ application, all the objects are custom objects..tool bar, tree, tab all are custom objects. when we contacted hp those guys made clear that they would not support VC++ aplication by UFT/QTP. I am still fighting with custom objects, making all custom objects in to standard objects and tried to get the names. Here am able to get the tool bar names, but unable to fetch inside toolbar names. 1) There is no Native methods. 2) able to do click on toolbar. In my experience VC++ applications are some of the hardest apps to automate. Is this an application that your company developed — if so you should ask your developers to provide a method that would allow you to get the data you need. Can you get around the toolbar navigation by using sendkeys? i got tha tool bar information by making winobjects to standard object.. I am able to record the script in UFT but unable to run the script. I am getting an error as ‘Can not identify the object…..” However, I have matched the objects with object repository. Can anybody please suggest..
First thing is when you use record and play no need to add or map objects in object repository..
2)If you are adding objects manually to repository then those have to be saved and it should mapped. After doing step2, if you wish to see the object hierarchy just drag the objects to UFT Editor..
3)Please check relative path and absolute path as well before u run the script. Im automating a vc++ application in which a custom grid table os there which is recognized as winobject by the qtp. Is can u suggest what are the methods which i can try to retrieve the text inside the cells. I tried getvisibletext,gettextlocation ..etc methods. These are giving different results in various runs. I am working with Jquery Chosen control(Its like a dropdown control). I am not able to click the control and provide to value. can some help me on the same. After installing Unified Functional Testing (UFT) 11.5x, there could be pages in the Web application that no longer load correctly when UFT is open. It was confirmed that uninstalling UFT (or latest Service Pack) resolves the issue. Note: The recommendation is to subscribe the e-mail notification for updates about it (even planned fixes if any): “E-mail me when this enhancement request is update or resolved”. Note: If JQuery application’s version is lower than currently available versions on site, check lower section called “Past Releases” where older versions are offered. Line (9): “JavaWindow(“SAFIRA – Engineering Client”).JavaObject(“KTable”).Click”. the I can’t get the menu bar back. Even if I right-click and select “Customize -> Toolbars -> Restore All”. I can’t even check-off the “Menu Bar” option. Sorry not sure this works for me every time for this issue: https://www.joecolantonio.com/2011/05/16/qtp-missing-menu-items/ Have you tried a re-install? Can’t we use virtual object if QTP is unable to identify the objects. Can someone explain me in which case we will use low level recording mode and when we will use Virtual object. I am facing issue wherein the object is captured while recording script or capturing through object spy. But when i try highlight it through object repository, it fails. Which in turn fails my script. I have written Automation Script to export the excel from application and save it in specified folder location with Specified name,code is working fine but its exporting the excel to the download folder instead of specified folder location. Same code is working as expected in the other systems.Please help me. Hi all, I have been working in Qtp/Uft for the past 2 years. I’m facing a strange behavior when running the scripts in Uft on Google Chrome browser. If suppose the object identified from the chrome is having a space in its property value. The space between the words Test and A is identified as some ASCII character 160 instead of space, when I’m checking for the objects existence it was failing. Is there an option/way/possibility in UFT such that it reads the object’s property value from application as plain text. It’s always feel pleasant to visit here. :) and read the unexplored things related to QTP and Selenium. I want to know, is there a way to access QTP/UFT’s object spy functionality as a standalone application through API. I don’t want to open UFT app, but still want to access object spy. Is it possible? Do you have any idea about Catia application, i think this is developed on VC++.we are trying automation with UFT. Here it seems all the objects are virtual objects. i tried a lot to get the object inforamtion but i could not gone thorough. when i am trying to record in both(standard and low level) nothing is happening even Local OR is also NOT generated. If you have any information please suggest. Hi Sri – Sorry I have not worked with Catia before – anyone else have any suggestion for Sri about UFT with Catia? I have designed QTP script for WebApplication to run on IE, Chrome & Firefox. THe script runs successfully without any error on my system. However if I run the script on other machine the script on IE fails but that on Chrome and Firefox is successful. QTP is not able to recognize one Table object. If I delete the exisitng table in my repository and add it again from the application, and then try to run the script or highlight the object from OR, it fails to recognize this newly added object too. The IE version on both the systems are same. I checked the QTP settings too. Everything is same. Also I have a VM wherein I can login using 2 different IDs and the same behvior is observed. With one ID the Script runs successfully however with the other ID the script fails. Object is identifying and executing scripts successfully in one machine. When i trying the same execution in other machine, it is not identifying the objects in the screen. How do we resolve this issue. Is object is getting vary from machine to machine?? Please help on this. Usually a machine specific issue not an application issue. Hard one to troubleshoot. I am having a different kind of issue. I’m using UFT 11.53. I have to automate NITRO addin of Excel. I can identify the Object as Winlist and I need to do selections within that Winlist. I can’t do that selection with any of the operations that are available with that object. Added .Net, java, ActiveX, VisualBasics and Web. can anyone resolve this issue? automate to run batch for 2 scripts. Login with user id and password, and job fails in later part of the code and it did not reach the code where system is to log out, as qtp can fail for whatever reason, lag in server can caused job to fail. application prevents concurrent log in. However if script 1 passes the task, this concurrent login will not surface. So how should I control the script 2 in order to check for this scenario. In my AUT, i have a table to verify, when i am identifying through object spy its getting identified but while running its getting failed. i checked and got to know that almost few parts of the webpage are getting identified as webtable, multiple matches leads to error, this is happening only with webtable as there is no peculiar property to identify it. help me in resolving this issue? I have Developed Vb Script in 11.5 version. This Script was working fine in same version. Now I am upgraded to 12.02 ,same script is not working in this version. Child Objects are not identify the Tool. We are using the flex based application. facing problem for recognizing drop-down selection. We were automated an application which was developed on GWT using Insight objects in UFT. We were facing few issues with insight objects, please go thorough below issues and provide any solutions if experienced already. 1. Insight objects are identifying and scripts are running properly on local machines but insight objects are not getting identified on Remote machines. 2. Recently, installed UFT 12.51 trial version on two windows 7 and IE8 machines and started running Scripts with Insight objects. None of the existing insight object is getting identified on one of the machine but new insight object is getting identified on the same machine. Everything going good on other machine. What could be the root cause for this issue? I am using UFT 11.5 and it is not recognizing Java Objects. Application can be opened in the same system. Also while recording its taking up on the basis of Co-ordinates. i’am identify web objects on web based application . me what settings i have do it in QTP. i am writing a descriptive programming, and on running i t, it is throwing error that the” WebEdit object was not found in the Object Repository”. This made it fail.how can i resolve it. I am automating windows application, and as per developer its build on Java. Even after selecting different Add-ins, its identifying objects as WinObject. How to know which add in or patch needs to be added.